Kloopr is a new alternative to UberEats, Deliveroo and Menulog that aims to reduce food waste and maintain a lower carbon footprint than other delivery services. Founded in Melbourne by Joe Wee Lim and Brian Foong, Kloopr encourages venues to offer reduced menus and a set number of portions per dish available on the app, giving the chefs more control and a better indication of how much stock they will need to order. The delivery fee is set at $3.50, lower than its competitors' standard $5 fee, which will be donated to Kloopr's partner business, Foodbank Victoria, the state's oldest and largest independent and not-for-profit organisation providing food relief to those in need. Kloopr is also boasting a low commission rate. Most third party take cuts of between 20 to 30 per cent of the food price from venues, but Kloopr will take 15 per cent. There will also be no exclusivity contracts or joining fees for venues. Kloopr has announced that the app will also allow diners to be their own drivers, in order to lower its carbon footprint, saying that users can register to become a “kloopr” and start picking up deliveries at their convenience, for themselves or other customers. 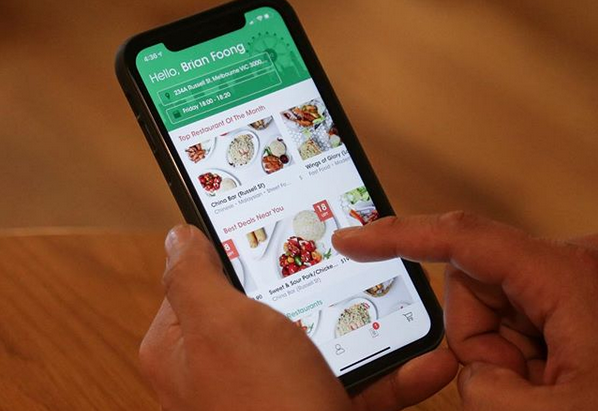 Before its official launch, a date for which has not yet been announced, diners will soon be able to download the app to order food from several restaurant partners that are already on board, including Drumplings, Wings of Glory and China Bar, all in Melbourne's CBD. Kloopr noted that according to research from comparison site finder.com.au Australians spend $2.6 billion on food and drink delivery per year. With this in mind, Kloopr plans to extend its reach interstate, eventually hitting the market in Singapore and Malaysia too.